Today is Easter Monday, celebrated in Cleveland as Dyngus Day! We haven’t had much time to post recently, so even though we are a little late to the party, we figure there’s still a little time to share some Easter bread, this time with a local influence. In Cleveland there has historically been a large Czech population, especially in the appropriately-named Slavic Village neighborhood, which also hosted a large Polish population. One of the most traditional Czech Easter foods is Mazanec – an leavened sweet bread with dried fruit and raisins, served primarily at Easter. Mazanec is considered a cousin of the English hot cross bun, and sometimes also has a cross shape on top. You can try making Mazanec for your spring celebrations with a recipe from Honest Cooking. 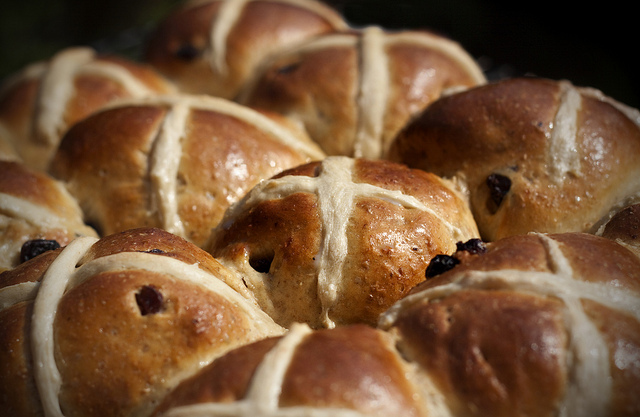 Hot Cross Buns are a sweet treat traditionally associated with Good Friday, the Friday before Easter. These little doughy goodies are sweet rolls with currants and a signature cross made out of icing on top. Their origin is could possibly go as far back as ancient Greece, but they really came to fame in England, when a law was passed prohibiting the sale of spiced breads at any other time but funerals, Christmas and Good Friday. In the intervening centuries, the laws fell, and hot cross buns have spread across the world, even becoming popular year-round. They are now available all over the English speaking world, and 70 million were sold by British supermarket chain Tesco on Easter weekend alone in 2010. The classic recipe is pretty similar all over the world: check out this recipe for Trinidadian hot cross buns, and another classic take from the UK. Though classic is good, why not try a chocolate-orange variety, too? 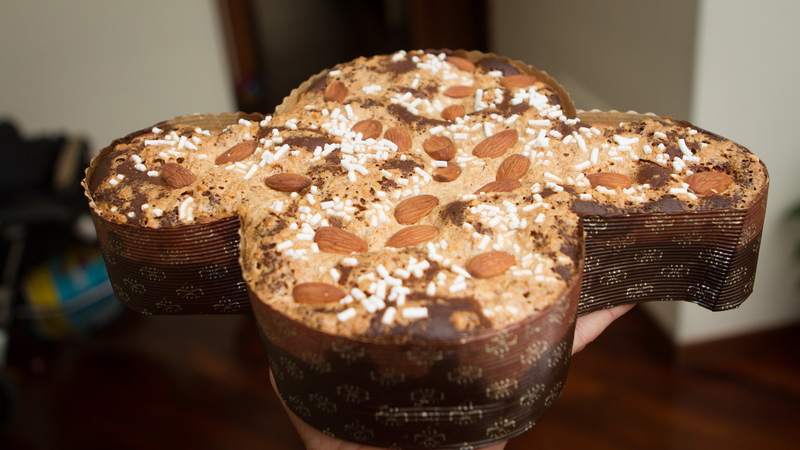 Italians are all about festive breads for holidays: Christmas has Panettone, and Columba di Pasqua (“Easter Dove” in English) is brought out for Easter. Like panettone, this Milanese bread is made with yeast, and filled with candied citrus peel, however what sets it apart is its unique dove shape and a generous topping of pearl sugar. Also like panettone, it is a little hard and time-consuming to make, and requires a yeast starter. However, that doesn’t mean it isn’t worth an effort, and King Arthur Flour has a great and detailed recipe. They are typically baked in dove-shaped paper or metal pans (though the King Arthur Flour recipe goes freeform), but if you don’t have those, you can buy your Easter dove at many Italian bakeries, Eataly, and even Trader Joe’s. Mexico Cooks! 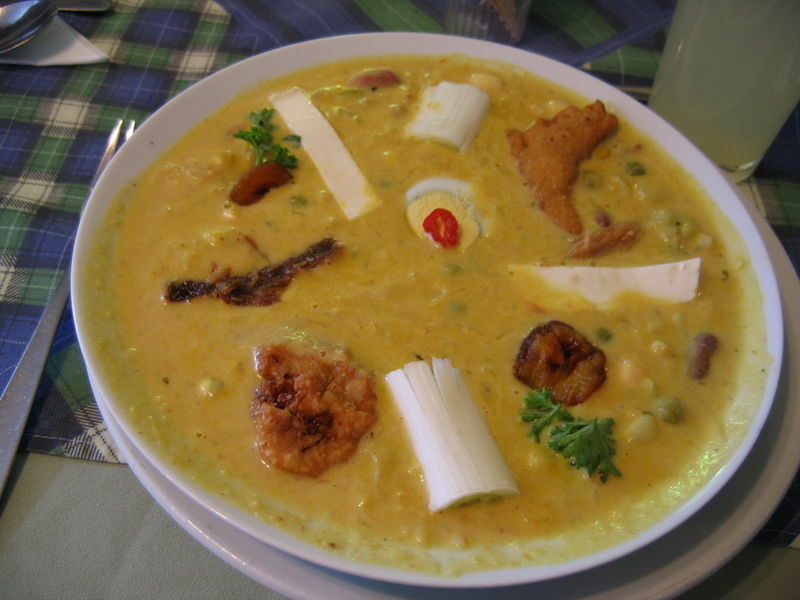 has an extremely interesting post about special Lenten foods in Mexico. For those observing Lent (La Cuaresma in Spanish), the 40 days leading up to Easter, meat is typically not eaten on Fridays. It is cool to see these more unique veggie and fish-based dishes popular for Lent in Mexico – certainly an alternative to the Friday fish fry. 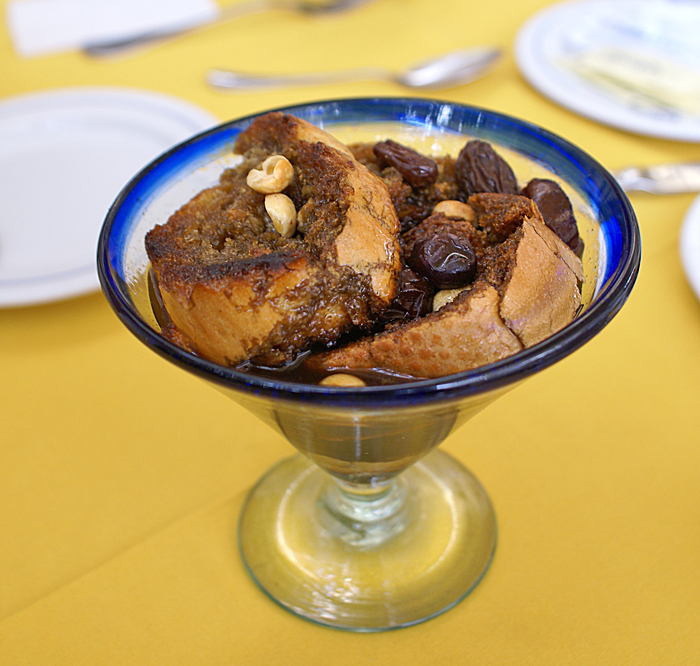 I think we would especially like to try the Capirotada bread pudding – and Mexico Cooks provides a pretty enticing recipe at the link above. Happy Easter! Easter really crept up on us this year, though we had the chance to make bunny-shaped chocolate cupcakes (yum!). However, if you are in the mood for something a little different, how about Koulourakia, braided, buttery Greek Easter Cookies. 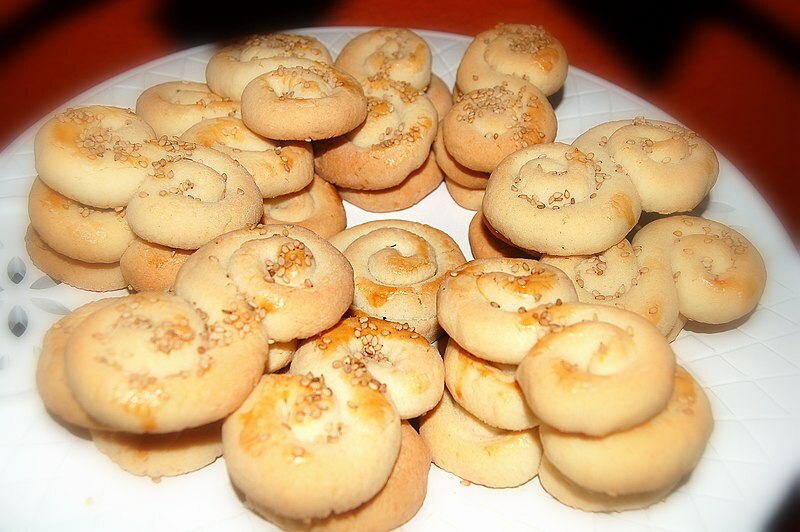 These cookies are traditionally eaten around Easter, and sometimes around Christmas as well, and are often topped with sesame seeds. Kalo Pascha! Loyal reader José, who previously introduced us to the Portuguese delicacy, Tripa, sent us some great information about typical Portuguese Easter cakes: Bolo da Páscoa and Folar. Bolo da Páscoa (literally translated to English as Easter Cake) is a simple, delicious cake, popular around Easter time in Portugal. However, even an even more unique Portuguese Easter delicacy is the Folar da Páscoa. Folar (which has no English translation), basically a sweet yeast bread, varies from region to region, and could be classified into a few major varieties. The first kind, from the Algarve in Southern Portugal, is a very sweet cinnamon and anise-flavored bread, typically decorated with whole eggs colored with onion skins. This type of Folar also reminds us of classic Italian Easter Bread with its colorful whole-egg topping. The other type of Folar, from the North of Portugal, is a simpler bread which is less sweet than the Algarve version. Another version of Folar from the very north of Portugal, near Spain, called Folar de Trás-os-Montes, sometimes contains ham or bacon! Piglet in Portugal has a recipe from Central Portugal, and Portuguese Girl Cooks shares her grandparents’ version of the sweet variety of Folar. Tia Maria has a recipe for savory Folar. Thanks for the tip, José! We absolutely love Easter candy, a particular favorite being Reese’s Peanut Butter Eggs. However, in Brazil we have discovered a new Easter obsession that dwarfs Reese’s Eggs in every sense: giant chocolate eggs! In the US we have seen chocolate rabbits, chicks, and miniature eggs but the chocolate Ovos de Páscoa (Easter Eggs) in Brazil put them all to shame. We saw these big chocolate eggs all around town, including grocery stores, newsstands and chocolate shops (such as the chain Cacau Show). In the grocery store, in preparation for Easter, trellises were set up and were completely covered with wrapped eggs from different brands. Sizes of the Ovos ranged from a few inches to over a foot tall – with some costing as much as US$50. These eggs are not just solid (or hollow) chocolate – they are filled with other chocolates or creams. For example, the egg in the photo above is stuffed with truffles. Check out some of these exotic Chocolate Easter Eggs varieties (in Portuguese, but the pictures say it all). Though some Southern Italian delicacies have made their ways to the American shores: Rum Baba, Cannoli, among others, we had not encountered Pastiera (also known as Pastiera di Grano) until our trip to Naples. Pastiera is especially associated with Easter (though we also found it in Pasticcerias in November). Pastiera was developed in modern times by a Neapolitan convent, but also has an older history related to pagan Springtime festivals (hence the inclusion of wheat and egg). Pastiera is composed of a pastry shell with a ricotta, wheat and egg filling, which may also be flavored with citrus or spices. Pastiera is unique – and in order to make it you need to prepare a special wheat mixture (unless you have access to prepared soaked wheat – which this recipe includes). While in Naples we saw large Pastiera pies even being sold in tins – perfect for every Easter table. Celebrate Easter with Pysanky – intricate Ukrainian Easter eggs! 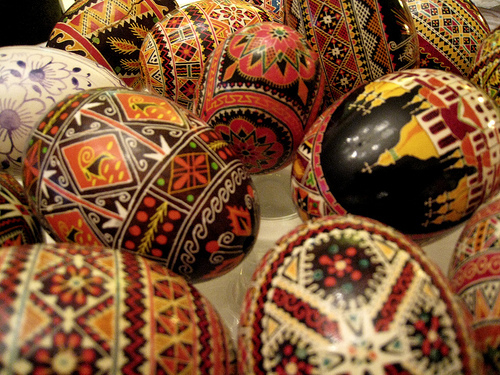 Happy Easter – enjoy these beautiful Pysanky eggs from the Ukraine! These types of eggs are made using a wax-resist method where the designs are drawn on with a wax stylus and then dye is applied. These Pysanky definitely make American-style food-colored eggs jealous. Though it may be a little late, Instructables and Design*Sponge have guides on how to make your own Pysanky.